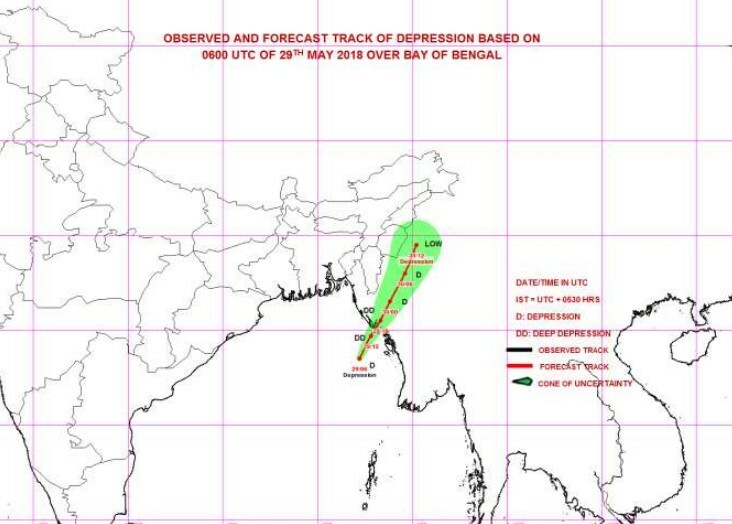 Depression is located at Latitude 18.8 degree North and Longitude 93.0 degree East, centre pressure of depression is 996 hPa and maximum wind speed near the center is 72 km per hour at 13:30 hrs MST today according Myanmar Meteorological Center. The depression over East Central Bay of Bengal has moved to Northeast wards. It is centered at about 64 km West of Manaung, 128 km South of Sittwe, 80 km Southwest of Kyauk Phyu. It is expected to move Northeast wards. It is very likely to intensify further into a deep depression during next 6 hrs and cross Myanmar and adjoining Bangladesh coasts between Kyaukpyu and Teknaf (Bangladesh) close to Sittwe around night of today, the 29th May 2018 according RSMC of New Delhi. Under the influence of depression rain or thundershowers will be will be fairly widespread to widespread in Naypyitaw, Sagaing, Mandalay, Magway, Bago, Yangon and Ayeyarwady Regions, Kachin, Shan, Chin, Rakhine and Mon States with isolated and regionally heavy falls during (29.5.2018) to (31.5.2018). Rain amount exceed 77-mm (3-inches) and above in Upper Sagaing, Bago, Yangon and Ayeyarwady Regions, Kachin, Shan, Chin, Rakhine and Mon States and 38-mm (1.5- inches) and above in Naypyitaw, Lower Sagaing, Mandalay and Magway Regions. Frequently squalls with rough to very rough sea will be experience off and along Mynamar Coasts. Surface wind speed in squalls may reach (45) m.p.h. Wave height will be about (10- 16) feet in off and along Myanmar Coasts. People should be awared of strong wind, heavy rain, flash flood and landslide in the hilly areas and near small rivers and also domastic flight, trawlers, vessels and ships off and along Myanmar coasts according Department of Meteorology and Hydrology of Myanmar.